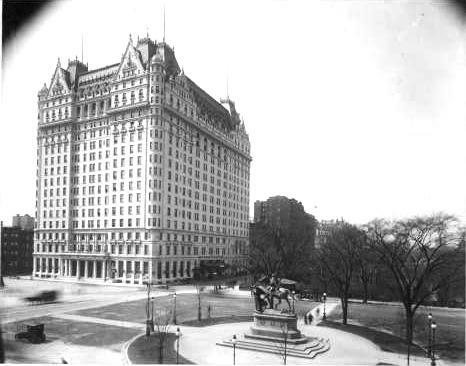 Just fifteen years after the original, first-class Plaza Hotel was opened, Fred Sterry announced on June 12, 1905 that it would be razed and a new Plaza erected on the site. Sterry, who was from Hot Springs, Virginia, had big plans. “The new hotel will be about seventeen stories high and in width and depth pretty much the same size of the old one. The architect is J. H. Hardenberg, who planned the Manhattan…In general plan the new hotel will resemble the Carlton Hotel in London. Sterry got the architect's name slightly wrong. 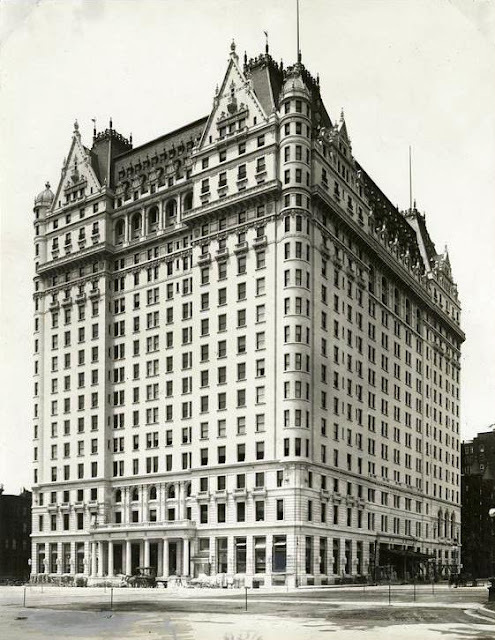 It was Henry J. Hardenbergh, who was responsible for the Dakota Apartments, the Waldorf and Astoria Hotels, and other distinctive structures. 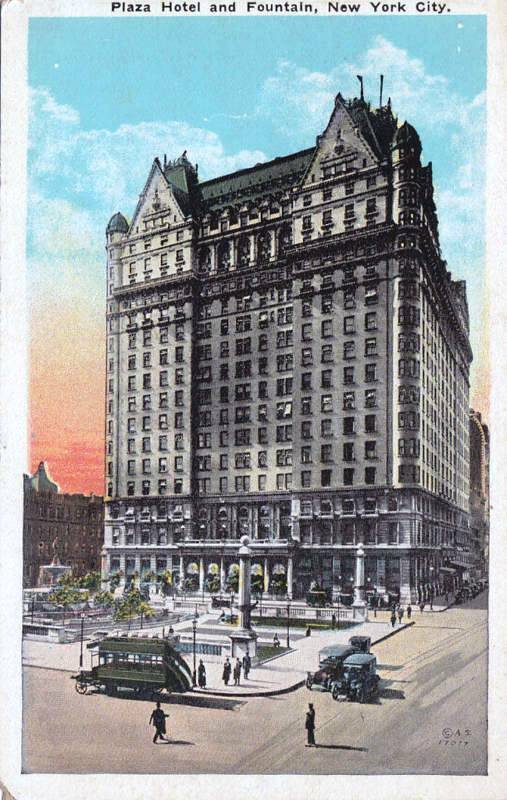 The old Plaza Hotel was demolished the following month and construction began immediately. Things took an ugly turn when a year later, the George A. Fuller Construction Company hired non-union iron stairway workers to work on the building. Despite the scandal and sensational trials that followed, construction continued and the opulent hotel was completed in September 1907. The astonishing $12.5 million cost of construction and outfitting the hotel necessitated the largest mortgage ever placed on a hotel property. Permanent residents, among them Alfred G. Vanderbilt, George J. Gould, and Henry Fink, moved in on Monday morning, September 23 – a week before the public would be admitted, thus insuring privacy and discretion during move-in. Hardenberg had created a French Renaissance palace with corner towers, deep mansard roofs and steeply angled eaves reminiscent of his earlier Dakota Apartments. The interiors were lavish and breathtaking. French marble lined the walls of the Louis XVI-style main entrance. The furniture and carpeting of the main floor were all custom-made in France. The “tea room,” later to be known as the Palm Court, was modeled after the Winter Garden of the Hotel Carlton in London. Covered by a leaded glass dome, the walls were of Caen stone and Breche Violette marble. The grand ballroom, a white-and-cream Louis XIV reincarnation, was designed to accommodate 500 people. 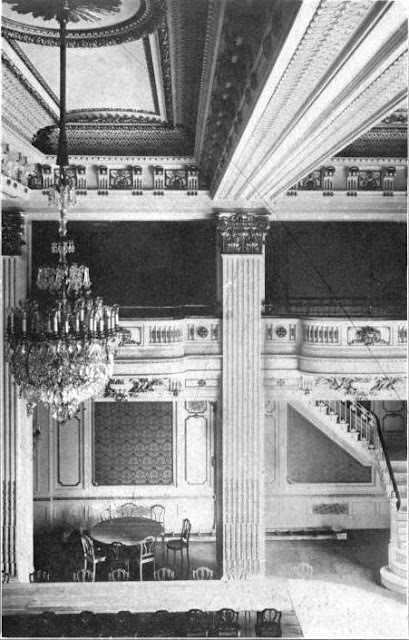 The rear portion of the U-shaped balcony surrounding the room could be lowered by “simply pushing an electric button,” to be used as a stage or concert platform. The section could be then returned to its original position when the floor space was needed. The well-heeled guests would expect to pay as much as $2.50 per night for the luxurious accommodations. 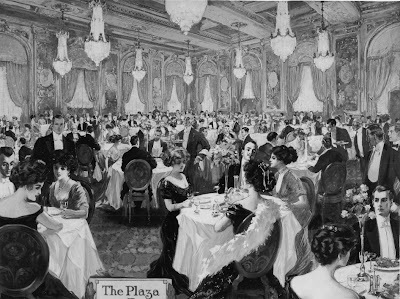 The Plaza immediately attracted New York’s elite. 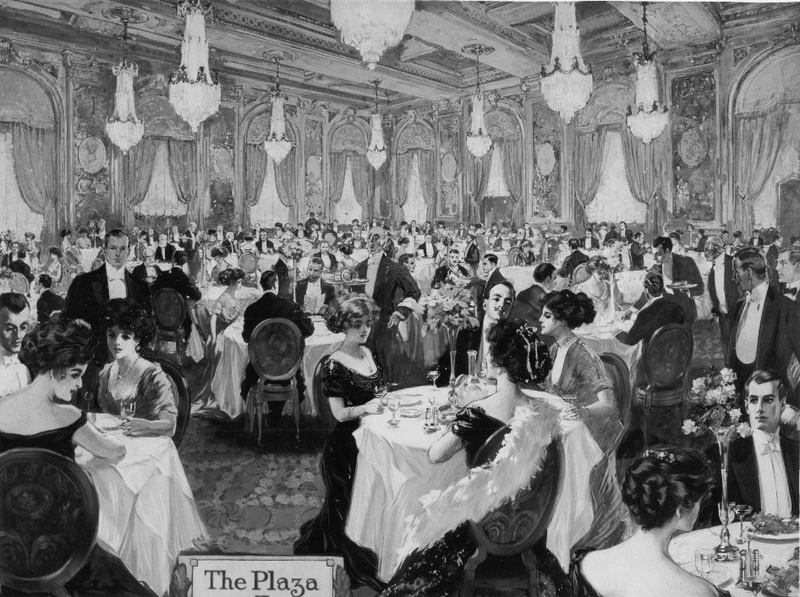 Wealthy socialites who had previously thrown balls and dinners at Delmonico’s and Sherry’s were now patronizing the new hotel’s gilded ballroom. 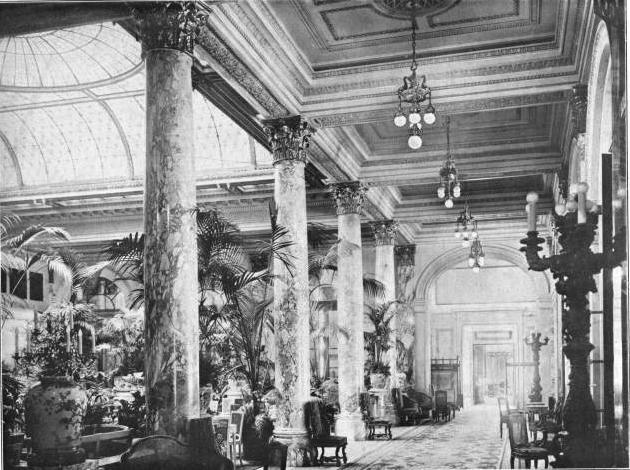 The Palm Court was the afternoon venue in which well-dressed Edwardian women gathered to be seen. Soon thereafter came the first of several new owners of the Plaza. In 1943 Conrad Hilton purchased the hotel for $7.4 million, spending another $6 on renovations. It changed hands again in 1955 when The Childs Company bought it for around $6.3 million. That year Kay Thompson wrote the first of the children’s books about Eloise, a young girl who lived at the Plaza. Through her books the grand hotel became known to children and parents alike world-wide. During this time Frank Lloyd Wright lived here for six years while designing the Guggenheim Museum. Further attention came when in February of 1964 the Beatles stayed here during their first United States tour; then again in 1966 when Truman Capote hosted his widely publicized “Black and White Ball” in the Grand Ballroom in honor of Katharine Graham. It was here, in September 1985 that the Plaza Accord was signed by the finance ministers of the US, West Germany, France, Japan and Britain; an agreement that would bring the dollar more in line with those foreign currencies. 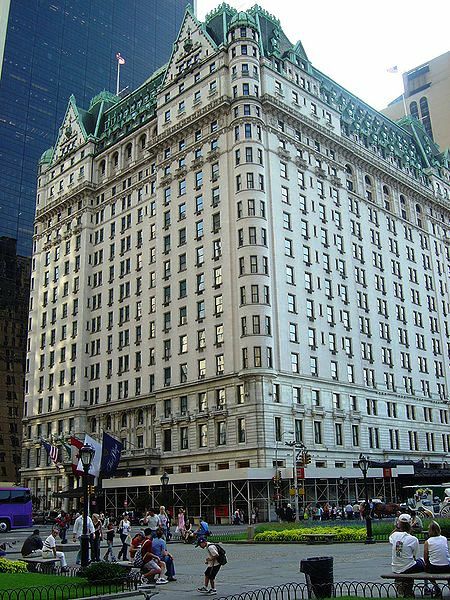 By the time Donald Trump purchased the Plaza three years later for $407.5 million, the hotel was showing its age. Nonetheless, Trump announced that “I haven’t purchased a building; I have purchased a masterpiece – The Mona Lisa.” The Plaza, after a $50 million refurbishing, gleamed again. In 1995 Trump sold the hotel at a substantial loss to Troy Richard Campbell, for $325 million. Campbell resold the property nine years later for an astonishing $675 million -- $838,509 a room -- to developers El Ad Properties. 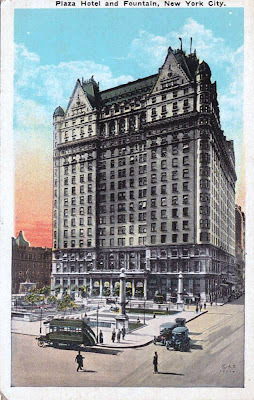 El Ad Properties had big plans for the Plaza; however because the building had been designated a New York City landmark in 1969 and a National Historic Landmark in 1978, interior and exterior alterations were closely scrutinized. The renovated Plaza reopened on March 1, 2008 with 282 hotel rooms and 181 condominiums; as well as a shopping area. The historic public areas were carefully restored, including the glass ceiling of the Palm Court which was removed during World War II for security purposes. In 2010 condomiums at the new Plaza were offered at $1,150 million for a studio to $42,4 million for a 6-bedroom apartment; a far cry from $2.50 per night.